If you need a sunroom contractor that has been in the home improvement industry for decades and always provides the best workmanship, look no further than ABC Seamless. When you choose us as your sunroom contractor, you can rest assured that we will install your sunroom with the highest level of skill to ensure that your it will provide many years of enjoyment. 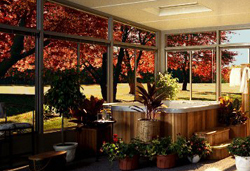 Whether you use your sunroom as a place for a home office, exercise room, hot tub, or entertainment room, it’s certain that our sunroom will be an investment that will not only add value to your home, but also enhance the enjoyment you get from living in it. We’re a trusted sunroom contractor that has earned an A+ rating from the Better Business Bureau and countless loyal customers. So, contact us today for more information about our TEMO sunroom construction and other patio options for Omaha, Blair, Red Oak, Papillion, Council Bluffs, and other local communities.